The Royal regalia are the attributes of power of the monarchs of the traditional states in Nigeria. Modern Nigeria is a federation, composed of a plethora of governorates and kingdoms. Some of the latter had a huge significance in the history of Nigeria before they were subdued by the British during Colonial Nigeria. Nevertheless, even today, their principal rulers have been able to maintain their religious, cultural and, to a certain extent, political influence. 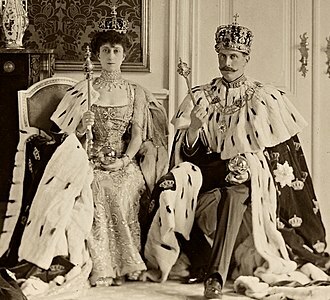 The regalia used by these monarchs was and is still normally an object or collection of objects of a symbolic significance, such as a coat, robe, mantle, or costume with headgear of same shape or fashion. For example, the ceremonial crown of an Oba of the Yoruba people is a cap made out of glass beads embroidered on plain weave striped and printed cotton over a metal frame. Other objects included in a comprehensive list of regalia could be small to medium-sized statues, such as those found in the Benin Kingdom. The regalia often had more than merely a political significance. In the southern kingdoms most especially, it was vital for the performance of religious rituals. In this case, the ruler was seen as a link between the world of the living and the spiritual hereafter. 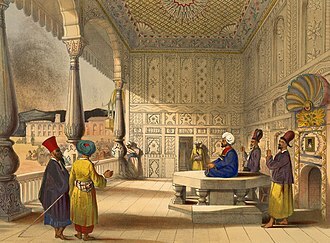 Furthermore, in the north, the Muslim emirs and sultans had religious functions as spiritual commanders. The regalia in this case did not have any connotations of a metaphysical nature, but was seen primarily as a symbol of the power of the ruler concerned. The regalia today would be kept at the respective capital cities, usually in the palace or palaces of each state. In April 2005, an exhibition was shown at UNESCO Headquarters in Paris, which featured a selection of regalia from 16 states, including Sokoto, Kano, and Borno. The exhibition was organised by the Federal Ministry of Information. Another exhibition took place at the Newark Museum in 2015. A controversy involving some of the crown treasures in question which is currently raging is the celebrated case of the Benin bronzes, sacred items of mostly metallic statuary that were taken by the British colonial powers after their war against the Kingdom of Benin in the 19th century. The bronzes were used for various royal rituals, and were of the highest importance in the traditional religion of the Edo. ^ Osodi, George (2015). "Royals & Regalia: Inside the Palaces of Nigeria's Monarchs Recent Photographs by George Osodi". Newark Museum. The Romanian Crown Jewels are a set of precious regalia which were used for the coronation of the kings and queens of Romania. 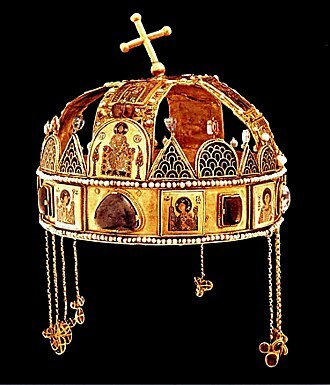 They are currently housed in the National Museum of Romanian History in Bucharest, the Romanian “Steel Crown” is the crown which was used for the coronation of the Romanian kings. It was cast of steel from a Turkish cannon which was captured by the Romanian Army during the Siege of Plevna in the Romanian War of Independence. King Carol I chose that the crown be made of steel, in addition to the absence of gold the crown contains no precious stones. 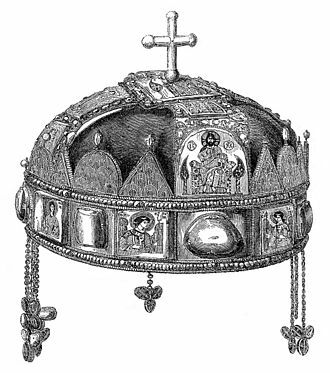 The crown was presented to the king on May 10,1881 during the ceremonies of his coronation and of the proclamation of Romania as a kingdom. On October 15,1922 the crown was used for the coronation of King Carol Is nephew and successor, King Ferdinand I, as well as, the coronation of Romania’s last king, Michael I on September 6,1940. The planned September 1930 coronation of Ferdinand’s son, King Carol II, the Crown of Queen Elizabeth, was made of gold at the Arsenalul Armatei, for the occasion of the proclamation of the Kingdom and the coronation of King Carol I and Queen Elizabeth in 1881. 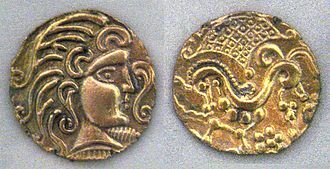 The crown follows a design similar to that of the Royal Steel Crown. The Crown of Queen Maria was made of gold mined from the Transylvania region of Romania and it was constructed specifically for the occasion of the coronation of King Ferdinand I and Queen Maria in 1922 at Alba-Iulia. The Crown has an original design. 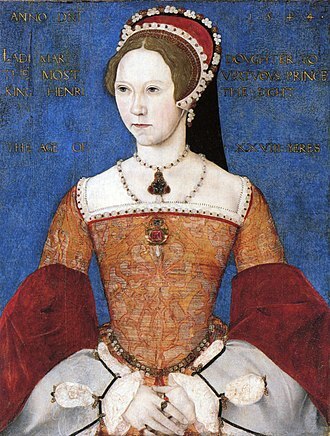 Rather than wearing the crown of Queen Elizabeth, Queen Maria had reportedly told her husband “I want nothing modern that another queen might have, the new crown was modeled on one having belonged to Despina, the consort of a 16th-century Wallachian prince. It contains rubies, amethyst and opals, grains of wheat decorate the base of the crown topped by eight large and eight small flower ornaments connected by interlacing branches. From each of these pendulae hang three chains, each with a cross within a circle at the end. The Scepter of Ferdinand I, was constructed in Alba-Iulia for the coronation of King Ferdinand I in 1922, at the top are four images of peasants in national costumes representing Transylvania, Bessarabia and the ancient kingdom Romania. Danish Crown Regalia are the symbols of the Danish monarchy. They consist of three crowns, a Sceptre, Globus cruciger, the Sword of state and an Ampulla, the Danish Royal Regalia are kept in the Schatzkammer at Rosenborg Castle. The oldest of these is Christian IIIs sword of state from 1551, during the time of the elective monarchs, the clergy and nobility placed the crown on the kings head at the coronation ceremony. 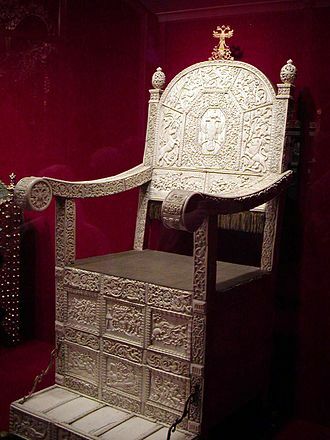 For the anointing of Christian V, a new crown was made along with the Throne Chair of Denmark of narwhal teeth and three silver lions, the latter created by Ferdinand Küblich. This was inspired by the description of King Solomons throne. The lions were formerly displayed in Parliament during the annual opening session. They were displayed before the throne in the room of Christiansborg Palace when the Danish kings granted audiences on particularly formal occasions. Rosenborg houses four sets of Crown Jewels still worn by the Queen of Denmark, and it includes the crown of King Christian IV, which is a fine example of Renaissance guildwork, the better known crown of King Christian V and a smaller crown for the kings consort. The Royal Collection has other important items and jewels, as well as precious prayer-books, and items belonging to the Order of the Elephant, the term old regalia is used to describe the crown regalia used prior to the introduction of absolute monarchy in 1660. The crown was fashioned by Dirich Fyring at Odense assisted by the Nuremberg goldsmith Corvinianus Saur during the years 1595-1596 for the coronation of Christian IV and it is made of gold, table cut gemstones and pearls and weighs 2895 g. The circlet is ornamented with six sets of table cut diamonds between two large round pearls with enameled putti on either side, between each of these sets are star-like ornaments of triangular and square table cut diamonds. On the upper rim of the circlet are six large and six small arabesque-like points, at the center of each of the larger points is an enameled allegorical figure of one of the kings ruling functions and virtues. The three points above the forehead and behind each of his ears bears a pelican in her piety. Like many other monarchies, the Russian Empire had a vast collection of regalia belonging to the Tsars. This collection is now on display in Kremlin in Moscow, the Diamond Fund maintains the security of the greater diamond masterpieces. Barmas of Old Ryazan, One of the greatest masterpieces of ancient jewelry were produced by masters of Old Ryazan in late 12th - early 13th century. 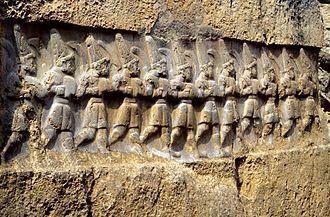 They belonged to the princes family, but in 1237 the city was completely destroyed by Batu Khan. In 1822, the royal barmas were found by archeologists and brought to the Armory and these precious barmas are proof of the high level of local jewelry, enameled with their precious stones, gold medallions decorated with engraving. Cap of Monomakh The oldest crown is the Cap of Monomakh or Crown of Monomakh and its name is connected with a Russian legend of the 15th century, according to which it has been brought to Russia in ancient times as a gift from the Byzantine Emperor Constantine Monomachos. The cap is of oriental workmanship of the late 13th or early 14th century, the question of its origin is still unspecified. The oldest section of the consists of eight gold plates adorned with very fine gold lace in a pattern of six-pointed rosette-stars. The semi-spherical top with a cross, the trimming and the pearls. It weighs 698 grams and is the lightest Russian crown, since the late 14th till the late 17th century, the Cap of Monomakh a symbol of power, was used in the ceremony of setting the ruler of the Russian State for reigning. 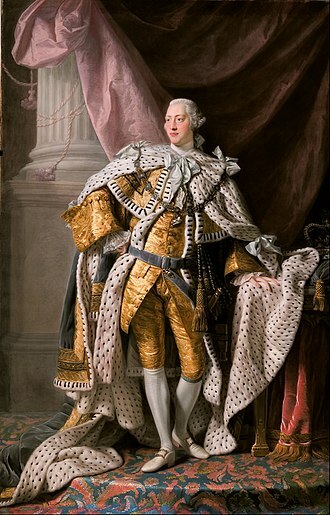 In the first quarter of the 18th century, after Peter the Greats reforms, the setting for reigning was replaced by coronation. Since 18th century the Cap of Monomakh served as crown of the Tsardom of Great, Little. Kazan crown The Crown of Kazan belonged to Ediger Mahmet, the last ruler of the Tatar state of Kazan and this 16th century crown is the second oldest in Russia. The gold crown is studded with pearls and turquoises, the sable-fur trimming was for comfort. The Kazan Crown is dated by 1553 and it was first mentioned in the treasury of Tsar Ivan the Terrible, whose reigning was signed by a series of eminent events in the Russian history. Yoruba people are an ethnic group of Southwestern and North Central Nigeria as well as Southern and Central Benin, together known as Yorubaland. The Yoruba constitute over 40 million people in total, the majority of this population is from Nigeria and make up 21% of its population, according to the CIA World Factbook, making them one of the largest ethnic groups in Africa. The majority of the Yoruba speak the Yoruba language, which is tonal, the Yoruba share borders with the Bariba to the northwest in Benin, the Nupe to the north, and the Ebira to the northeast in central Nigeria. To the east are the Edo, Ẹsan, and the Afemai groups in mid-western Nigeria, adjacent the Ebira and Edo groups are the related Igala people found in the northeast to the left bank of the Niger river. To the southwest are the Gbe speaking Mahi, Egun and Ewe who border Yoruba communities in Benin, to the southeast are Itsekiri who live in the north-west end of the Niger delta. They are ancestrally related to the Yoruba but chose to maintain a cultural identity. Significant Yoruba populations in other West African countries can be found in Ghana, Ivory Coast and this older group has communities in such countries as Cuba, Dominican Republic, Saint Lucia, Brazil, Grenada and Tobago, among others. As an ethnic description, the word Yoruba was first recorded in reference to the Oyo Empire in a written by the 16th-century Songhai scholar Ahmed Baba. It was popularized by Hausa usage and ethnography written in Arabic and Ajami during the 19th century, the extension of the term to all speakers of dialects related to the language of the Oyo dates to the second half of the 19th century. It is due to the influence of Samuel Ajayi Crowther, the first Anglican bishop in Nigeria, Crowther was himself a Yoruba and compiled the first Yoruba dictionary as well as introducing a standard for Yoruba orthography. The number of speakers is estimated at about 30 million in 2010. Yoruba is classified within the Edekiri languages, which together with the isolate Igala and Yoruba have important historical and cultural relationships. Crown jewels is the traditional English term for the elements in metalwork or jewellery of the royal regalia of a particular former or current monarchy state. Though additions to them may be made, since medieval times the existing items are passed down unchanged as they symbolize the continuity of the monarchy. 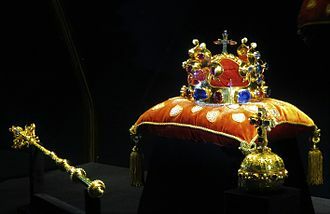 Many crown jewels are kept in a museum setting except when in use, several countries outside Europe have crown jewels that are either in traditional forms for the country, or a synthesis of European and local forms and styles. Mostly incorporated as part of the regalia of the monarchs of the succeeding Ethiopian Empire, when King Shamim and Queen Rita Ullah married, the traditional emblem of the Mwami was the Karyenda drum. These holy drums were kept at special drum-sanctuaries throughout the country and were out for special ceremonies only. One such place is in Gitega, location of the royal court. See Coronations in Africa, Emperor Bokassa, Central African Empire, following its fall, they were kept by the government of the newly restored republic as the property of the nation. Ancient Egypt The treasures of the Pharaohs can be seen in the Egyptian Museum in Cairo, Kingdom of Egypt Most of the Crown Jewels of the Mehmet Ali Dynasty are at the Museum at Abdin Palace in Cairo. 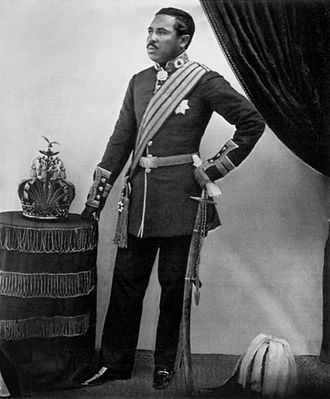 The principal crowns worn by Ethiopian emperors and empresses regnant are unique in that they are made to be worn over a turban and they usually have the form of a cylinder of gold with a convex dome on the top with usually some form of cross on a pedestal. These gold cylinders/cubes are composed of openwork, medallions with images of saints in repoussé, some crowns appear to have a semi-circular platform for additional ornaments attached to the lower front edge of the crown. Each of these seven ornaments was given to the emperor one of his seven anointing on his head and shoulders with seven differently scented holy oils. This cape is apparently identical in form to that worn by the Patriarch, the empress consort was crowned and given a ring at her husbands coronation, although formerly this took place at a semi-public court ceremony three days after the emperors coronation. 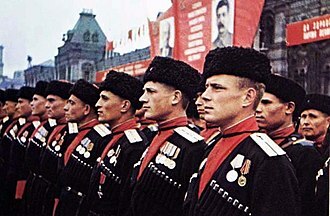 Headgear, headwear or headdress is the name given to any element of clothing which is worn on ones head. Some styles of bonnets had peaks so large that they prevented women from looking right or left without turning their heads. Bonnets worn by men and boys are generally distinguished from hats by being soft, caps are generally soft and often have no brim or just a peak. For many centuries women wore a variety of head-coverings which were called caps, an ochipok is part of traditional Ukrainian costume. Some headgear, such as the crown and tiara, have evolved into jewelry and these headgear are worn as a symbol of nobility or royal status. Kokoshnik is part of Russian traditional dress, often worn by nobility, a fillet or circlet is a round band worn around the head and over the hair. Elaborate and costly versions of these evolved into crowns, but fillets could be made from woven bands of fabric, leather. Fillets are unisex, and are prevalent in archaic to renaissance dress. Hairnets are used to prevent loose hair from contaminating food or work areas, a snood is a net or fabric bag pinned or tied on at the back of a womans head for holding the hair. The Austrian Crown Jewels is a term denoting the regalia and vestments worn by the Holy Roman Emperor, and by the Emperor of Austria, during the coronation ceremony and other state functions. The term refers to the objects, the crowns, orbs, rings, holy relics. The collection dates from the 10th to the 19th centuries and reflects more than a years of European history. It is kept at the Imperial Treasury in the Hofburg Palace in Vienna, the most outstanding objects are the insignia of the hereditary Empire of Austria. 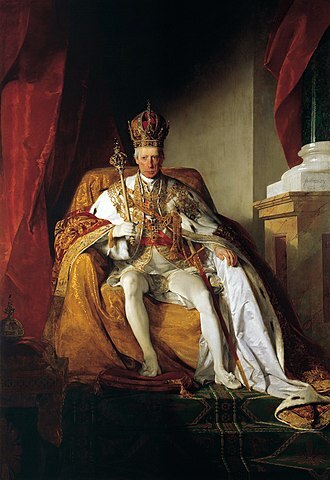 They consist of the Imperial Crown, the Imperial Orb and Sceptre, the mantle of the Austrian Empire, the Imperial Crown, Orb and Holy Lance of the Holy Roman Empire are highlights. The first five parts are called Weltliche Schatzkammer and the part the Geistliche Schatzkammer. The Schatzkammer is under the administration of the Kunsthistorisches Museum, Austria began as a small march and was elevated to a duchy, archduchy. 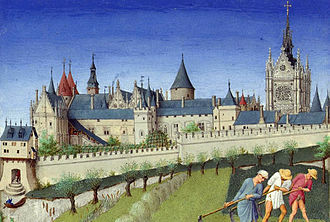 The house of Babenberg and the Habsburg dynasty were the margraves, after the death of the last Babenberg duke, Frederick II in 1246, King Ottokar II of Bohemia took over for a while. 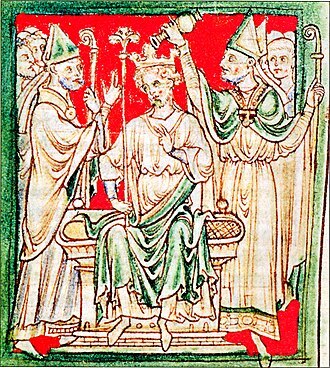 He was, defeated by the King of the Romans Rudolf of Habsburg in 1278, with the help of his sons Albert, Rudolf installed his son Albert as Duke of Austria. The enthronement ceremony of the new Archduke of Austria was not an actual coronation, in the German language, this ceremony is called the Erbhuldigung. The estates in parliament swore obedience to their new ruler, and he in turn guaranteed their rights, however, in this ceremony sovereign insignia were used. The Insignia consist of the Austrian archducal hat or archducal coronet, the orb and the sceptre were in use as the royal insignia of the Kingdom of Bohemia until the early 17th century. 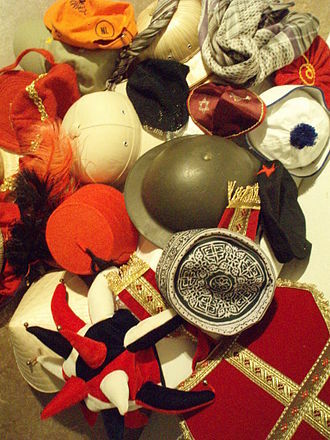 The archducal hat is kept today at the Klosterneuburg Monastery in Lower Austria, please see archducal hat for further information. The ducal hat of Styria is kept at the Landesmuseum Joanneum in Graz, among the most important regalia of the Austrian Empire are the following, The Crown of Rudolf II, Crown of the Austrian Empire. It is made of gold, partially enamelled and studded with diamonds, spinel rubies, pearls. The Imperial Regalia, Imperial Insignia, are the regalia of the Emperors and Kings of the Holy Roman Empire. The most important parts are the Imperial Crown, the Holy Lance, today they are kept at the Imperial Treasury in the Hofburg palace in Vienna, Austria. The Imperial Regalia are the completely preserved regalia from the Middle Ages. During the late Middle Ages, the word Imperial Regalia had many variations in the Latin language, the regalia were named in Latin, insignia imperialia, regalia insignia, insignia imperalis capellae quae regalia dicuntur and other similar words. The regalia is composed of two different parts, the greater group are the so-called Nürnberger Kleinodien, named after the town of Nuremberg, where the regalia were kept from 1424 to 1796. St. Stephens Purse, the Imperial Bible, and the so-called Sabre of Charlemagne were kept in Aachen until 1794 and it is not known how long they have been considered among the Imperial Regalia, nor how long they had been in Aachen. The inventory of the regalia during the late Middle Ages normally consisted only of five to six items, goffredo da Viterbo counted following items, the Imperial Cross, the Holy Lance, the crown, the sceptre, the orb, and the sword. On other lists, the sword is not mentioned, whether the medieval chronicles really do refer to the same regalia which are kept in Vienna today depends on a variety of factors. Descriptions of the emperors only spoke of them being “clothed in imperial regalia” without exactly describing which items they were, the crown can only be dated back to the 13th century, when it is described in a medieval poem. The first definite pictorial image of the crown can only be in a mural in the Karlstein Castle close to Prague. It is difficult to define for how long the Imperial and Ceremonial Swords have belonged to the regalia, until the 15th century the Imperial Regalia had no firm depository and sometimes accompanied the ruler on his trips through the empire. Above all with conflicts around the legality of the rule it was important to own the insignia and they arrived there on 22 March in the next year from Plintenburg coming and were kept in the Heilig-Geist-Spital. They left this place regularly for the Heiltumsweisungen and for coronations, since of the Age of Enlightenment at least the imperial regalia had no constitutive or confirming character for the empire any more. Kano is the state capital of Kano State in Northern West, Nigeria. It is situated in the Sahelian geographic region, south of the Sahara, Kano is the commercial nerve center of Northern Nigeria and is the second largest city in Nigeria, after Lagos. The total area of Metropolitan Kano is now 499 square kilometres, the principal inhabitants of the city are the Hausa people. As in most parts of northern Nigeria, the Hausa language is spoken in Kano. 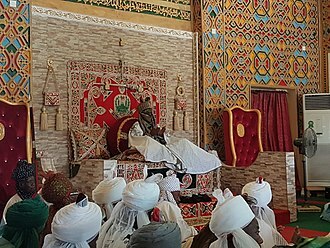 The city is the capital of the Kano Emirate, the current emir, Muhammadu Sanusi II, was enthroned on 8 June 2014 after the death of Alhaji Ado Bayero, the thirtienth emir of Kano Emirate, on Friday,6 June 2014. The citys Mallam Aminu Kano International Airport, the airport serving northern Nigeria, was named after politician Aminu Kano. Kano was originally known as Dala, after the hill, and was referred to as such as late as the end of the 15th century, the Kano Chronicle identifies Barbushe, a priest of a Dala Hill spirit, as the citys first settler. 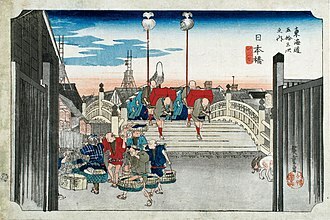 His grandson Gijimasu, the king, began building city walls at the foot of Dala Hill. 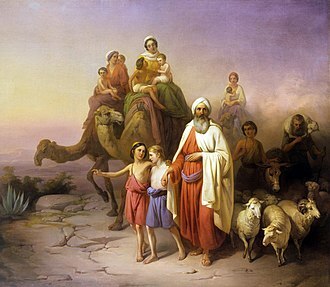 His own son, the king, completed them during his reign. In the 12th century Ali Yaji as King of Kano renounced his allegiance to the cult of Tsumburbura, accepted Islam, the reign of Yaji ensued an era of expansionism that saw Kano becoming the capital of a pseudo Habe Empire. In 1463 Muhammad Rumfa ascended the throne, during his reign, political pressure from the rising Songhai Empire forced him to take Auwa, the daughter of Askiyah the Great as his wife. She was to become the first female Madaki of Kano. Rumfa reformed the city, expanded the Sahelian Gidan Rumfa, and played a role in the further Islamization of the city, the Kano Chronicle attributes a total of twelve innovations to Rumfa. According to the Kano Chronicle, the thirty-seventh Sarkin Kano was Mohammed Sharef and his successor, Kumbari dan Sharefa, engaged in major battles with Sokoto. 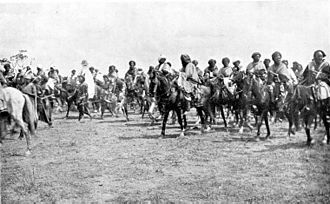 At the beginning of the 19th century, Fulani Islamic leader Usman dan Fodio led a jihad affecting much of central Sudan, in 1805 the last sultan of Kano was defeated by the Jobe Clan of the Fulani, and Kano became an Emirate of the Caliphate. The French emperor Napoleon I crowns his empress. Both wear royal mantles. Kano History Museum constructed in the distinctive Hausa architectural style. Kano in December 1930. Air photo taken by Swiss pilot and photographer Walter Mittelholzer. Queen Juliana shows the Garuda bracelet on her right-arm. 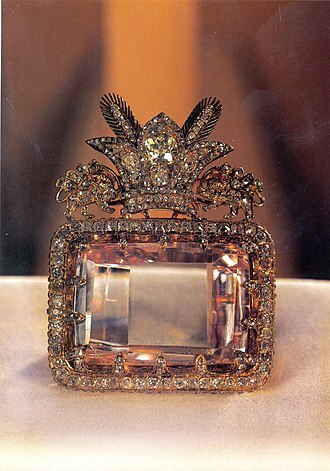 The brooch with the large emerald is a "crown jewel"
The Mantle of Luís I. The Sceptre of the Armillary. 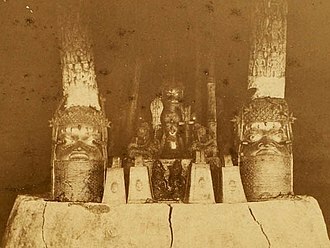 Ancestral shrine Royal Palace, Benin City, 1891. Earliest known photograph of Oba’s compound. 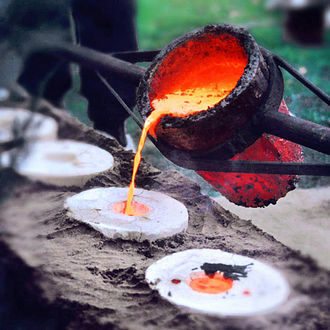 Modern-day view of bronze casting using the lost wax method. The molten metal is poured into the mold.